Explore the Emotional Eating Freedom Formula™ for your workplace! Overcoming U took the book, Don't Eat It. DEAL With It! and created a six-week webinar-based course to dive deep and create a healthy relationship with food. This course will give you the tools necessary to create your freedom from emotional eating. We eat when we are not hungry because we are anxious, angry, bored, sad, lonely, etc. Unfortunately, the food doesn’t deal with our emotions and creates more problems for us. Stop the cycle of reacting to stress with food. Learn effective coping techniques to deal with the stressors of your life. Create space in your life for something greater than thinking about food. or submit your information and we'll contact you! Don't Eat It. DEAL With It! 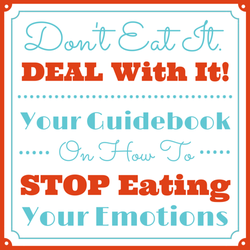 This guidebook walks you through the process of conquering emotional eating. This book contains the process that Heather has used over and over in her coaching sessions to help others move past emotional eating. Learning to deal with your emotions instead of pushing them down with food, will create your freedom from emotional eating. It is a practical, doable and livable process that creates peace and contentment for those who embrace it. The Follow-Up launches September 2016! ​Keep your eyes peeled because our monthly maintenance program will be here soon! We are creating support for all of those paradigms you have shifted and healthy habits you have created!